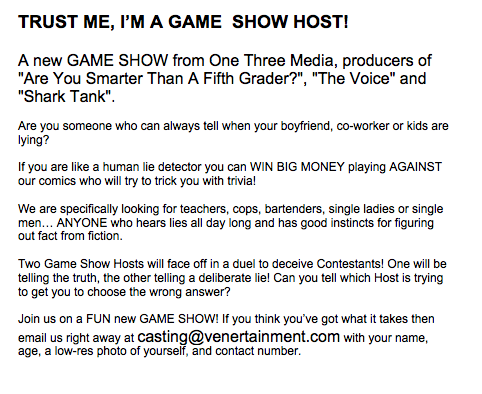 TRUST ME, I’M A GAME SHOW HOST! “Are You Smarter Than A Fifth Grader?”, “The Voice”, and “Shark Tank”. Are you someone who can always tell when your boyfriend, co-worker, or kids are lying? If you are like a human lie detector you can WIN BIG MONEY playing against our comics who will try and trick you with trivia! We are specigically looking for teachers, cops, bartenders, nannies, single ladies, single men…. ANYONE who hears lies all day long and has good instincts for figuring out fact from fiction. Two Game Show Hosts will face off in a duel to deceive Contestants! One will be telling the truth, and the other telling a deliberate lie! Can you tell which Host is trying to get you to choose the wrong answer? Join us on a FUN new GAME SHOW! If you think you’ve got what it takes then email us right away at casting@venertainment.com with your name, age, a low-res photo of yourself, and a contact number!